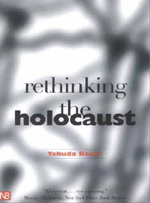 The title of this latest contribution from Bauer is slightly misleading; as valuable as it is, the volume is not really a rethinking of the Holocaust but rather a revisiting of the major problems and interpretations in Holocaust studies. Bauer, director of the International Institute for Holocaust Research at Yad Vashem in Jerusalem, begins with a short discussion of what exactly historians do. He quite rightly departs from standard practice when he asks such moral and "what if" questions as what could have been done? and what should have been done? Contrary to what he calls Elie Wiesel's "mystification" of the Holocaust, he insists that the catastrophe was a human invention and therefore historically and "rationally" explicable. Separate chapters deal with Jewish armed and unarmed resistance, and with rescue attempts--he examines, for instance, the case of Gisi Fleischmann, a Zionist leader who worked to get as many Jews out of Slovakia as possible, which Bauer uses to discuss issues of gender, arguing that women did not fight for the status of women separately but for collective and individual survival and for honor. Most fascinating for non-Jewish readers are the chapter on Jewish theological attempts to explain the Holocaust and Bauer's valuable synthesis and reexamination of some of the major interpretations of the Holocaust. Bauer ends by looking at how the Holocaust is related to the creation of the state of Israel in 1948 (he rejects, for instance, the notion that "a guilt complex" on the part of Western countries led them to vote for partition of British Palestine). (Jan.)Forecast: This book will become a staple of Holocaust literature and should enjoy a long, if quiet, life in print.